Series DVP double stags high vacuum mobile transformer oil purifier be able to quickly separate the harmful ingredients from transformer insulating oil, such as water, impurities, gas, acetylene, hydrogen, methane and others, the transformer oil after purification by DVP mobile vacuum transformer oil purifier can improve insulation performance, so that it can effectively guarantee the electrical equipment run safely. DVP double stages mobile vacuum transformer oil purifier is particularly suitable for high-grade transformer oil and online purification for more than 110KV substation. 3. The transformer oil purifier installs 1 micron filtering elements and removes 99% solids. 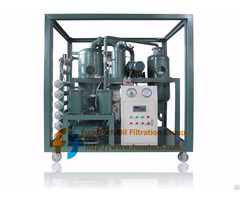 5.Germany vacuum pump and electric systems ensure oil purifier runs safely. Business Description: HENLA Oil Filtration Corporation has been devoting to design, engineer, and manufacture a quality line of oil filtration systems that will help clean and recycle industrial oil since our foundation, Our oil filtration systems includes insulating oil purifier, transformer oil filtration machine, hydraulic oil filtration machine, lube oil purifier, turbine oil purification systems and others industrial oil filtration systems. Our filtration system can help decrease the cost of maintenance, downtime, labor, and processing cost required by industrial concerns today.